From a military standpoint, it is widely regarded that planning and strategy are key indicators of success, both pre and post-conflict. The Art of War by Sun Tzu is a widely acclaimed book which extolled preparation, recommended patience and most importantly exploiting an opponents’ weakness. The Prophet Muhammad (ﷺ) masterfully engineered all the above when he rightfully reclaimed the city of Mecca following an unjust expulsion in the year of 622 CE. The Quraish were a wealthy and powerful tribe who relied heavily on annual pilgrimages from neighbouring nations to Mecca. However, tensions heightened as the Prophet's assertion of strict monotheism to the Quraish tribe ended in defeat. For economic reasons as well as fear of a rising Muslim following, the Quraish – a predominantly polytheist tribe – expelled, mocked and unsettled the Muslims after a decade of personal attacks against their religion and gods. As a result, Prophet Muhammad and the Muslim following departed for Medina, a city 200 miles north of Mecca. This migration is referred to as ‘Hijra’ among Muslims. Shortly after, a Quranic verse, Surah Al-Hajj 22:39, which sanctioned the right to bear arms in defence for the Muslims. The first time ever in Islam. Had the United Nations, existed then, they would have approved the Muslims cause to reclaim the city from where they faced expulsion. During this period, the Prophet established three broad strategies: establish peace with tribes adjacent to Medina, secondly, the use of a tight-knit group to obtain intelligence on Quraish, and the final strategy was to disrupt and intercept trade caravans that travelled close to Medina. The 3 strategies employed fall under political, military and economic. Ensuring and cementing peace treaties with tribes adjacent to Medina assured the Muslims that they would not face a military threat in unchartered territory and was a geopolitical coup by the Prophet . The famous proverb ‘knowledge is power’ is universally known but more common in the West as a quote which stretches to all walks of life. The military is ample evidence of this as no leader was successful without relying on or utilising a form of intelligence gathering. The Prophet was no different. According to Ibn Ishaq- al-Zuhri, the Messenger of God wrote him a letter but ordered him not to look at it until he had travelled for two days. After 2 days of travel 'Abd Allah b. Jahsh opened the letter and looked at it, and it stated, "When you look at my letter march until you halt at Nakhlah, between Mecca and al-Ta'if. Observe Quraish there, and find out for us what they are doing." When 'Abd Allah looked at the letter he said, "I heed and obey." Then he said to his companions, "The Messenger of God has commanded me to go to Nakhlah and observe Quraish so that I can bring him news of them.” . The use of spies’ during pre-military engagement was extolled by Sun Tzu so much so, he devoted the whole of 13th chapter in his Art of War book to this practice. The intelligence gathering by Abd-Allah b. Jahsh played a crucial role in the events that brought about battle proliferation and later the decisive victory for the Muslims. The purpose of the trade caravan interception was to disrupt Meccan economic trade as the caravans’ sole purpose was for the purchasing of weapons in preparation for a war with the Muslims. Upon the discovery of a trade caravan containing a wealth of merchandise, Abd-Allah b. Jahsh and the other group members, in an act of haste and confusion, decided to attack the Quraish guards protecting the trade caravan. Both sides lost combatants during this brief conflict. Upon their return, the Prophet was greatly displeased by the actions of Abd-Allah b. Jahsh and adamantly refused to take the spoils from the caravan as the killing of the guards took place during the truce month of Rajab . For Meccans, any form of violence is prohibited during Rajab. However, the Prophet received new revelation, Quran 2:217, which dictated that expulsion and persecution of Muslims were worse than killing in the month of Rajab. During the beginning of spring, Abu Sufyaan was reported to be leading a weapons caravan to be used in the war against the Muslims. 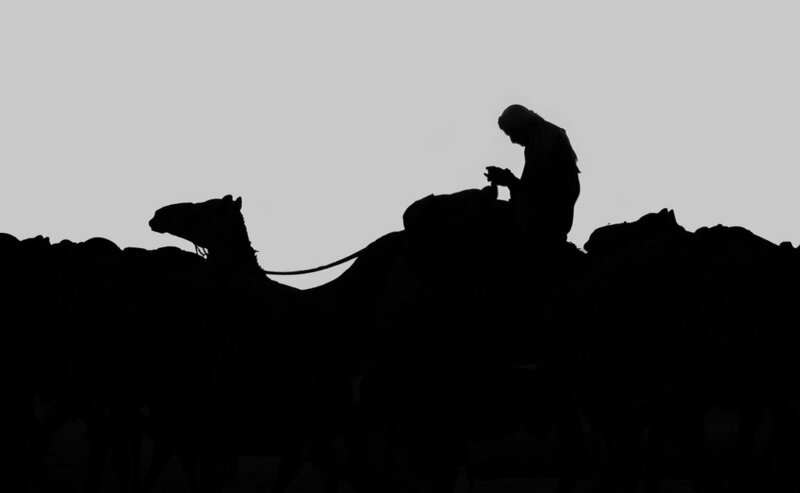 The Prophet gathered over 300 men to Badr to intercept the trade caravan. However, Meccan spies duly informed Abu Sufyaan of the Prophet’s intentions and adopted a new course, favouring the coastal line to reach Mecca. The Prophet arrived at Badr and spent the night there. During that evening, an interesting turn of events unfolded. The Prophet sent the head of a group of companions to the water of Badr, whilst the Prophet was engaged in night prayer. A few water carriers approached the water of Badr to draw water. Among these water carriers was a slave. The men the Prophet had sent, captured this man and returned him to the Messenger of God and interrogated him about Abu Sufyaan and his companions. The companions of the Prophet were under no impression he belonged not to Quraish . The Prophet overheard the conversation between the captured man and the companions. When the slave informed the Prophets’ companions of Quraish plan to meet them, they physically beat him and branded him a liar. The Prophet witnessed the actions of the companions and stated: “By Him in whose hand my soul rests, you beat him when he tells the truth and leave him alone when he lies?” The companions retorted "He is telling us that Quraysh has come." He replied, "He is telling the truth the Quraysh have come to protect their horsemen." He called the slave and questioned him, and the slave told him about Quraysh, and said, "I know nothing about Abu Sufyan." He asked him how many people there were, and the slave said, "By God, I do not know. There is a large number of them." They assert that the Prophet said, "Who fed them the day before yesterday?" and the slave named a man who had fed them. Then he said, "How many camels did he slaughter for them?" and the slave said, "Nine." Then he said, "Who fed them yesterday?" and the slave named a man. "How many camels did he slaughter for them?" he asked. "Ten," the slave said. The Prophet adamantly stated, "There are between nine hundred and a thousand of them." The number of Quraish combatants on that day was, in fact, 950. Thus confirming the outnumbering of the Muslims, a ratio of 3:1. Although the Muslims were heavily outnumbered, this did not daunt them and they still marched into battle. A battle which lasted a mere few hours, with Muslims securing a resounding victory. However, the aftermath of the battle cemented the legacy of two men. The first being Abu Sufyan, who led the caravan during the battle. This was a result of several noble deaths among the Quraish tribe. In the later years, Abu Sufyaan would successfully negotiate the peaceful surrender of Quraish along with becoming a high-ranking official in the Muslim empire. The second, more crucially, was the Prophet. The strategies employed by the Prophet served as the ultimate catalyst in a successful military campaign against the Quraish. The month of Ramadan has been held an importance in the history of the Muslims as the resounding victory against the Quraish sealed Islam as a force to be reckoned with in the Arabian Peninsula for the next century. Mirza Bashir Ahmad. "The Life and Character of the Seal of Prophets", Volume II Islam International Publications, 2013, pp. 89–92. Muhammad At Al-Madina. “The History of Al-Tabari”, Volume VII, The Foundation of the Community, A.D. 622-626/HIJRAH-4 A.H, pp. 17. Muhammad At Al-Madina. “The History of Al-Tabari”, Volume VII, The Foundation of the Community, A.D. 622-626/HIJRAH-4 A.H, pp. 19-22. Muhammad At Al-Madina. “The History of Al-Tabari”, Volume VII, The Foundation of the Community, A.D. 622-626/HIJRAH-4 A.H, pp. 20. Muhammad At Al-Madina. “The History of Al-Tabari”, Volume VII, The Foundation of the Community, A.D. 622-626/HIJRAH-4 A.H, pp. 30.